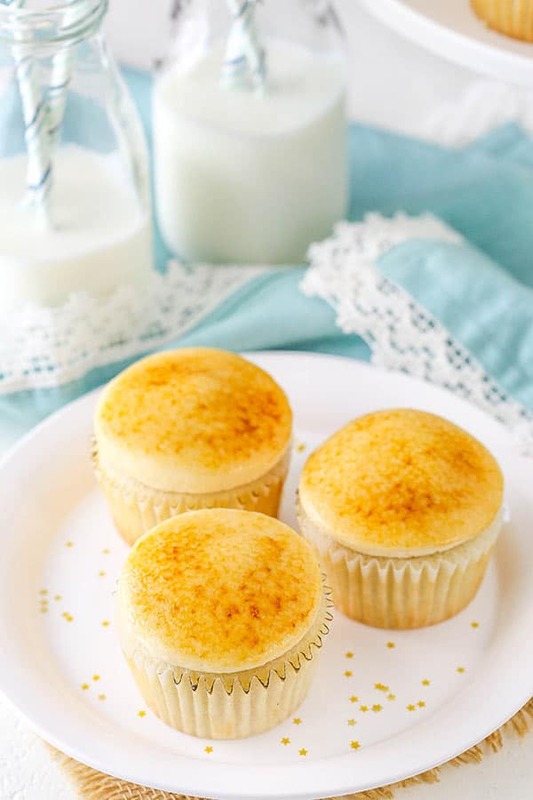 These Creme Brûlée Cupcakes are made with a moist vanilla cupcake and pastry cream filling, then topped with caramel frosting and a caramelized sugar top! They’re fun & absolutely delicious! So after wanting to get my hair cut for several weeks now, I finally went and got it cut on Saturday morning. I’m the kinda gal that doesn’t get her hair cut super often. I normally wait until it’s so long (for me) that I can’t take it anymore and then several weeks later I finally show up somewhere begging for an open spot to get it all chopped off. I planned a bit ahead last week and called Friday evening for a Saturday appointment. 😉 Of course at that point, the only appointment remaining was at 8:30am. I debated waiting longer still for a cut, but went ahead and took the early appointment. I was definitely the first customer there that day. Being early, it was nice and quiet and I thought for a second I might fall asleep. I’m very good at falling asleep when people are playing with my hair – I’ve even fallen asleep at the dentist before. It’s a talent. When my stylist was pretty much done cutting, he started drying my hair and as he did he said, “You have the healthiest hair, good job! It’s so healthy, I could date it!” HA! Not exactly the kind of thing I’d think of regarding hair, but we’ve all got our thing. 😉 At least I know waiting to cut it doesn’t seem to hurt it. These cupcakes are so stinking good! To get started, I used one my favorite vanilla cupcake bases. They are fluffy, soft and super moist. They use the creaming method so as usual, I’ll encourage you to be sure to fully cream the butter and sugar. It’s super important for the ultimate fluff factor! The filling is your classic vanilla pastry cream. I could totally eat it by itself with a spoon. Pastry cream is fairly similar to actual creme brûlée. 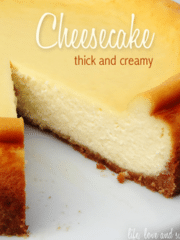 Similar ingredients, but cooking it over the stove as opposed to in the oven. 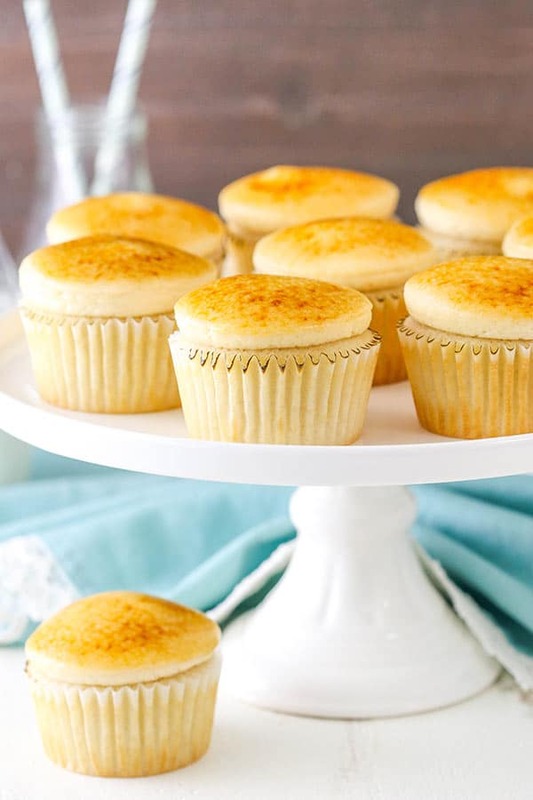 In the case of these cupcakes, it’s the perfect method for creating our filling. On top of the cupcakes is a delicious caramel frosting! When you cook sugar, you get caramel and since creme brûlée has caramelized sugar on top, I thought a light caramel frosting would be the perfect compliment! To frost the cupcakes, I used my large round tip, the Ateco 808. It’s nice and big and I love it. You hold the tip over the top of the cupcake, perpendicular to it and squeeze out the frosting until it spreads out to the edges. Then slowly lift the piping bag as you continue to pipe so that you create a nice dome shape. Once the cupcake is frosted, turn it over and dip it into some sugar. Next is torching the sugar with a lovely little kitchen torch. Arguably the most fun part of making these cupcakes. 🙂 I found that I got a better result with the caramelized sugar if I refrigerated the cupcakes for 30 minutes for so first. The frosting gets cold and firm that way and doesn’t melt when you torch the sugar on top. 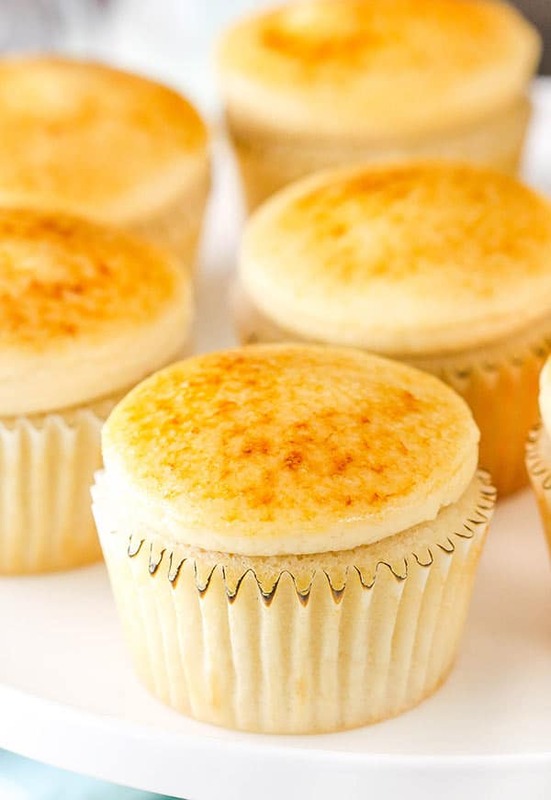 These Creme Brûlée Cupcakes are made with a moist vanilla cupcake & pastry cream filling, then topped with caramel frosting + a caramelized sugar top! 16. To make the frosting, beat the butter and shortening together in a large mixer bowl until smooth. 17. Add about half of the powdered sugar and mix until smooth and well combined. 18. Add 3 tablespoons of caramel sauce and and mix until combined. 19. Add the remaining powdered sugar and mix until smooth. 20. 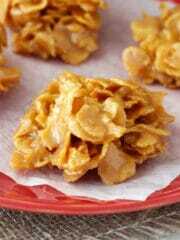 Add additional caramel sauce and the water or milk, as needed, to get the right consistency frosting. 21. 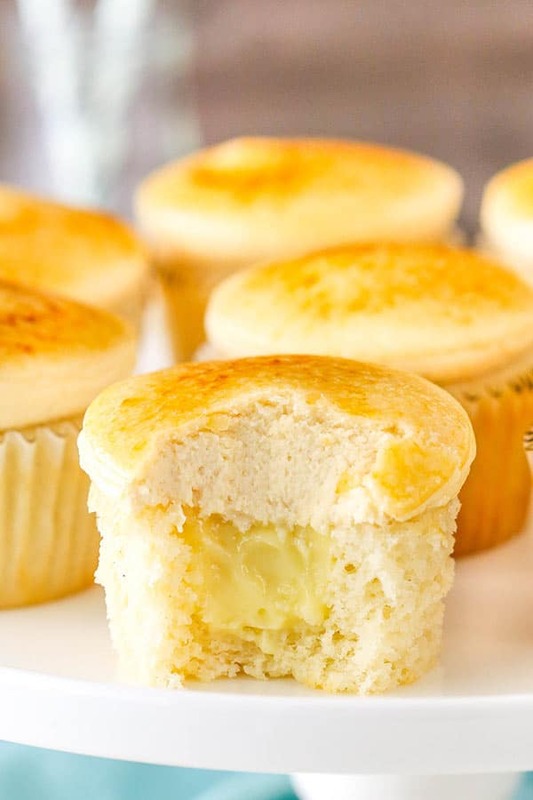 Use a cupcake corer or knife to remove the centers from the cupcakes, then fill them with the pastry cream. 22. Pipe the frosting onto the cupcakes. I used Ateco tip 808 to create the dome of frosting. 23. Add the sugar to a small bowl and turn the cupcakes over and dip them into the sugar, one at a time. 24. Refrigerate the cupcakes until the frosting is cool and firm, about 30 minutes to an hour. 25. Use a butane kitchen torch to caramelize the sugar on top. 26. Refrigerate the cupcakes until ready to serve. Best served cool, but not cold. These sound delicious! I don’t have a kitchen torch, though. Could they be broiled in the oven for a couple of minutes? You could try it, but I’m not sure that it’d apply enough heat quickly enough to caramelize the sugar though. What!! I can’t wait to try these. Awesome!!!! These lovelies are too good to be true! 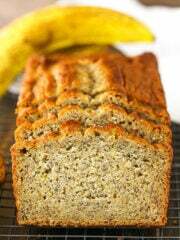 this recipes just keep getting better and better!! I cannot wait to try these! Can you see any problem with an all butter buttercream? I never use shortening unless a cake will be outside in the Texas summer heat. Thanks for sharing! I don’t think that’d be an issue. The only thing is to make sure the frosting is nice and firm before torching. The all butter frosting would melt more easily than the half butter, half shortening. These look fantastic! 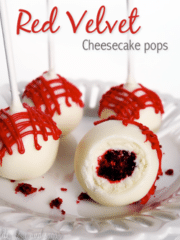 I am totally making these soon! 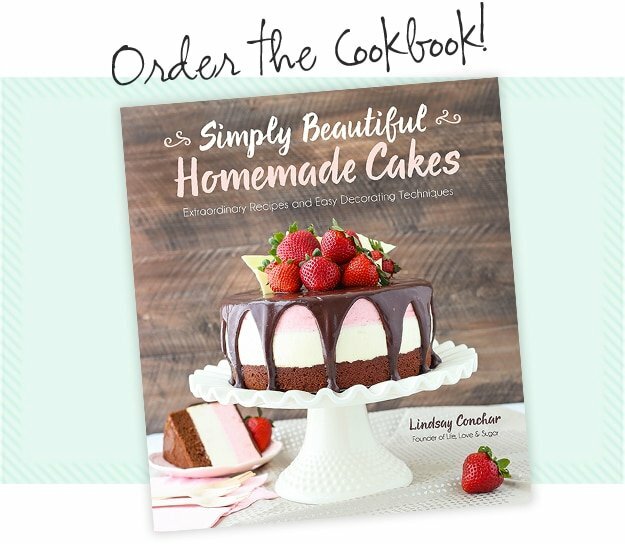 Thanks so much for the delicious recipes! Whoooaaa these look good. Also the SAME thing over here, I hadn’t had my hair cut in over a YEAR (!!) and I just got it done last week. I feel so much better! I want to date my own hair now! Haha. how do you make the caramel sauce? I actually used a store bought sauce. You could certainly make one though. Here’s my favorite. 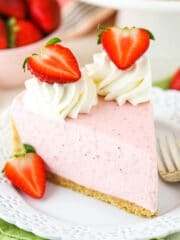 I just wanted to say that all of your recipes that I tried are not only delicious but stunning too and turn out time after time compared to other sites. I really appreciate the time and creativity you put into all of them, thank you. 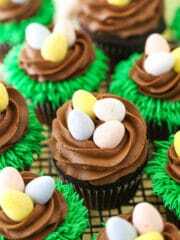 Can’t wait to make these later on today ???? So glad to hear that! Thanks Laila! I hope you enjoy these too! What the Creme Brulee’ is happening here Lindsay?? !!!! Giiiirrrrllll Wow !!!! 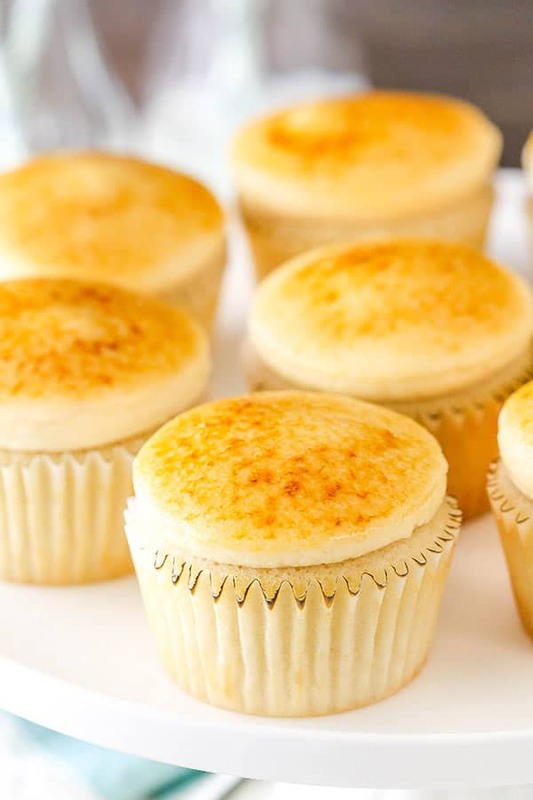 I’m so excited to make and taste these cupcakes as Creme Brulee’ is my favorite dessert, I became allergic to the Big C (Yes Chocolate) when I was 23 yrs. old and you dont realize how very little desserts there are that don’t have chocolate in them so you really have to work hard to find great tasting treats. 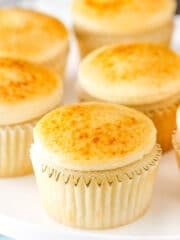 Creme Brulee’ is one that’s very simplistic as far as ingredients but packs amazing flavor throughout. Thank You for creating a different way to enjoy this dessert with variety, I cant wait to check out all your recipes you go girl !!!!!!!! I tend to share alot of recipes with my Family and Friends on FB, please let me know if it’s ok to do so with your recipes. I always ask as a courtesy if it’s ok because some folks are just not ok with it, Thanks Again Hun I appreciate it. ???? Chris ???? Do you whisk your egg whites and fold them in? Or use them in a liquid form? No, I just add them in. I don’t have a stand mixer, will a regular mixer work? Thanks! This is my first time posting…???? The cupcake and frosting are absolutely divine… LOVE the texture of the cupcake and the flavour of the frosting. I have not tried the filling this time, but will soon. Thank you for this delicious concoction???? I love the look of these. 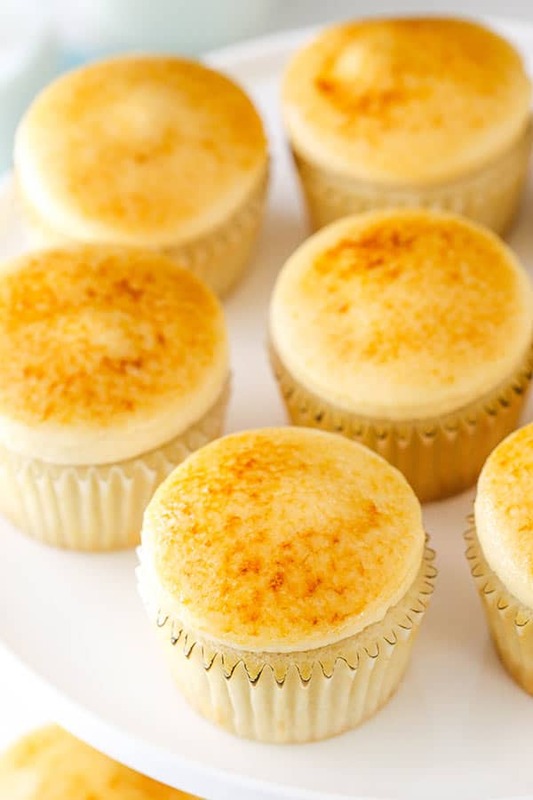 Creme Brulee is one of my favorite desserts, and this recipe seems like an awesome new way to enjoy it! 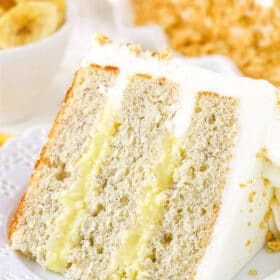 Hi, will be trying this recipe out in some days and since I’ll be short for time during the week …I was wondering if the pastry cream filling and the frosting could be prepared in advance and stored in the refrigerator…if so for how long and what steps would I need to undertake once I take them out of the fridge? Yes, they can be made ahead. The frosting should be fine for 1-2 weeks. The filling is best within 2-3 days, but would be fine for 3-4. You can use the filling straight out of the fridge – just give it a stir. The frosting will need to come back to room temperature and you’ll want to give it a stir as well. I just made these cupcakes today and you’re right they’re so stinking good! I really love the texture of this cupcake so light, soft, moist and fluffy. So thank you for being so generous to share this fantastic recipe. 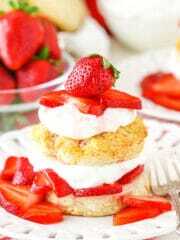 Question for you do you a cake version for this cupcake? Please….. thanks again! I’m so glad you enjoyed them! 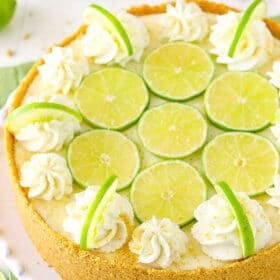 I don’t have a cake version, but you could definitely double it and make a cake. 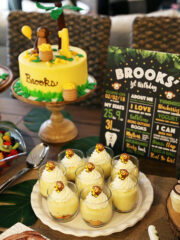 Here’s an example where I made the layers as a cake. 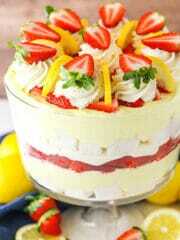 Can this be made into a cake instead of a cupcake? Thanks in advance! Yes, the cupcakes can be make into a cake, but you should probably double everything. Vos pâtisseries sont magnifiques. Je vais essayer dès que possible . J’adore la crème brûlée et le résultat est vraiment parfait. Bravo et merci ???? I made this today with a green filling for St. Patrick’s day BUT I used 1/4 cup of coconut oil for the frosting and it wouldn’t hold up for browning. Lesson learned. I now know why th. shortening was necessary.